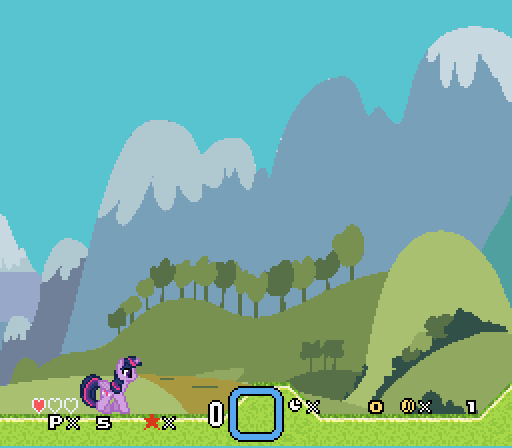 Yep, it's been 6 years, and I'm proud to present the VERY FIRST My Little Pony-themed Super Mario World hack on SMWCentral! Please note that I'm still trying to get this project up off the ground, and every screenshot except for maybe the title screen is subject to change, perhaps a lot. 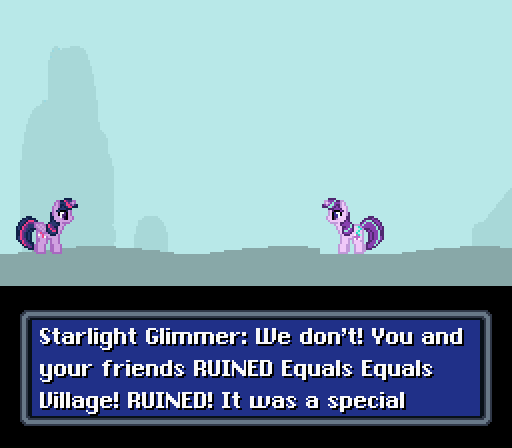 This is basically going to be a video game version of the Season 5 finale of My Little Pony: Friendship is Magic. I liked that 2 parter, so I'm making a game. The general plot is going to be similar to the original episode, but, as you can probably see from the screenshots above, I'm going to change details so the story works from a gameplay perspective. 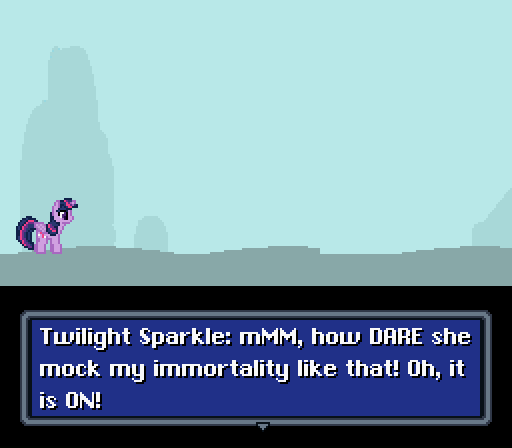 Being a gamer obsessed with fan games, I don't like how the My Little Pony fanbase continuously produces crappy, memey shovelware and treats the show and franchise as if it's a meme, so I'm determined to make an amazing, epic, show-accurate game. This isn't going to be your ordinary, everyday Mario World hack. 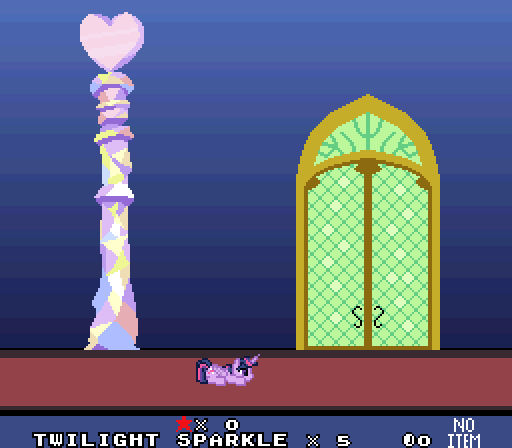 In this game, you play as Princess Twilight Sparkle. This is NOT simply Mario in costume. Oh no! OH NO! 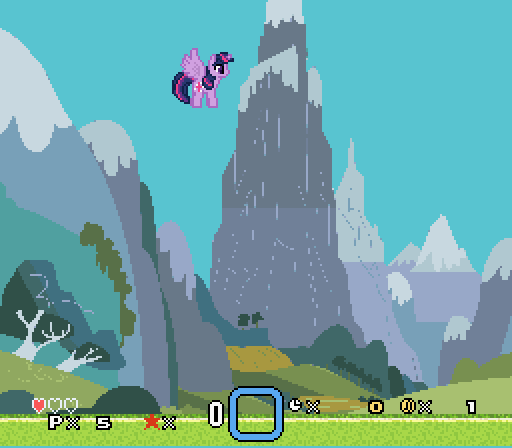 I'm going out of my way to change the game's physics and Mario's abilities and such to be more fitting for everyone's favorite Alicorn princess. In this game, you get free flight, just like Kirby. Twilight Sparkle can also fire magic blasts that go in a straight line or she can charge power for a bigger and more powerful blast that pierces terrain. The game doesn't follow Mario's normal power-down system. Getting hit will simply cause you to lose a heart, and you won't lose any abilities. This game will have no power-ups, no ? blocks, and no pipes except for the time warp portals. There will be no time limit. The game is going to try to focus more on exploration than general platforming. It's also going to have lots of cutscenes and be very story based. The gameplay in general is going to be much more similar to Kirby than Mario. It's going to feature many gimmicks you typically find in Kirby games, such as Bomb Blocks, Star Blocks, etc. O.K., so now, the worlds. You probably already know what they are though. There's also going to be a Special World (because what would a Super Mario World hack be without one?) I'll get into that later. In this game, you're not going to see Worlds 4, 5, and 6 for only 5 seconds. Each world is going to be just as developed as the first one, each with its own set of levels, lore, and story. 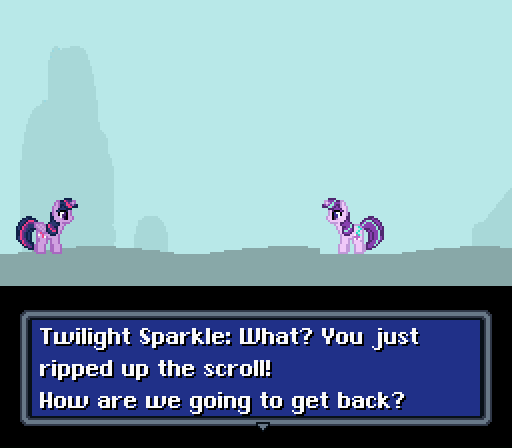 Yes, and Twilight Sparkle does eventually get back to Cloudsdale, even without the scroll. To do so, you have to defeat, Sombra, Chrysalis, etc. If you want me to tell you the details, I will. Almost every level will have 5 tokens that channel Friendship energy called Friendship Tokens. They're everywhere. You may have to go into secret areas or complete side quests to get them, and you HAVE to get some to access the last level of the world. They're basically exactly like Sun Stones, Code Cubes, etc. from modern Kirby games. Please don't fly over levels. You will not collect enough if you do this. I'll be posting more information, more complete screenshots, and some videos later. I'll also release a World 1 demo. So tell me your thoughts on this hack! And PLEASE follow the forum rules! That SMW status bar at the bottom is all kinds of nope to me, might want to use/edit one of Ladida's status bar patches. I'm actually curious to see how good the player animations are in this, as horse galloping in 3 frames is a a hard feat. Good luck young apprentice of Kieran. Well, I just finished watching the Season 6 finale on Netflix a few hours ago. It gave me an INCREDIBLE amount of inspiration for World 2. Expect to see stuff from the Season 6 finale in World 2. Thorax may or may not appear. I decided to change the name of World 2 from "New Changeling Hive" to "New Changeling Kingdom" because "Changeling Kingdom" is what Season 6 wants to call the Changeling home world. But would it be O.K. for me to put Season 6 stuff in this game? 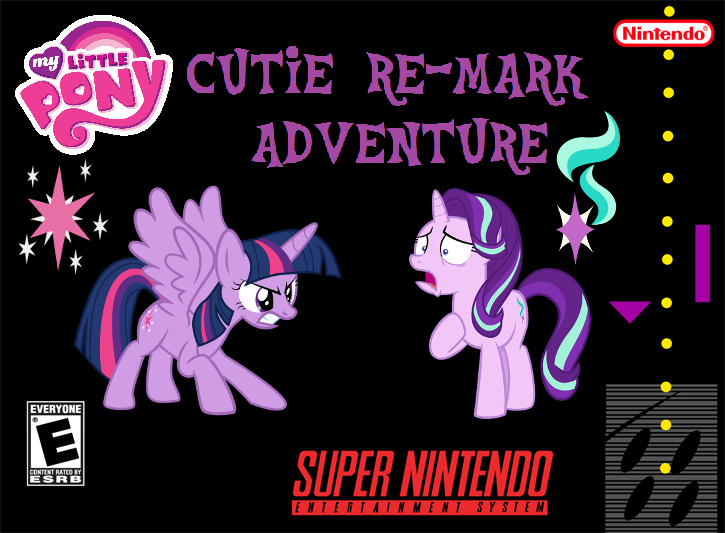 Cutie Re-Mark is Season 5. I still have to make World 1, though. We'll cross World 2's bridge when we come to it, and you don't have to answer the question right this second. As for the game right now, I'm currently working on the introduction. It'll probably be a while before I can make a post about more new content. In the meantime, I've made the screenshots bigger and added a new one. Woo-hoo! College is out! Summer has started! No more distractions and reduced free time! Now I can dedicate all of my time and effort into my hack! I've been working on the Status Bar recently. Some of the above posts even said that they didn't like the default Super Mario World Status Bar. Well, I've made heavy edits to the SMB3 Status Bar patch and this is the result. It's not exactly finished yet. I still need to draw the Dragon Coin graphic. The H's are placeholders for the hearts in the SMB2 Health patch. The hardest part in making my Status Bar and something I haven't done yet is changing the SMB2 Health patch so that it works with the SMB3 Status Bar patch. I may or may not be able to do it. If you want to help, either post a reply or PM me. Also, if someone could tell me how to get rid of the black pixels separating the game and the Status Bar, or at least change the color of the black pixels so it matches the rest of the Status Bar, that'd be great! Setting the IRQ scan line in the SMB3 Status Bar patch to a different value doesn't seem to remove the black pixels. Trying to change the tiles that would go on top of the black pixels has no effect either. And those are NOT Bonus Stars. It's the coin counter. They're like the stars in modern Kirby games. Collect 100 to get an extra life. 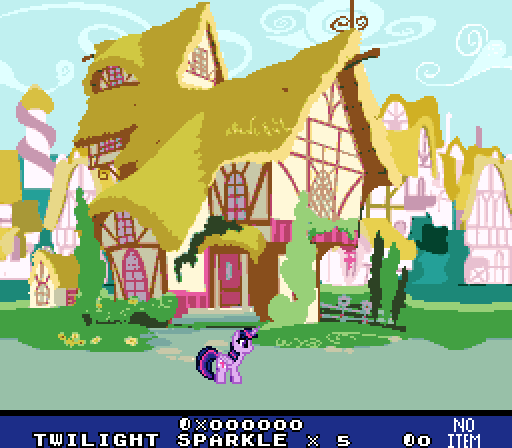 I haven't seen anything pony in forever but I'd totally play this. Some screenshots remind me of Story of the Blanks. I'm not one that watches MLP but I gotta say. The graphic work on this hack is pretty spot on! I'm just letting everyone know that I've released a demo in the C3 thread. All right, I've released an update to the C3 demo. It addresses some bugs and complaints about the previous version. This update even adds a boss at the end and a proper ending. There is also a credits. If I missed anyone, please let me know. Now, there are still a few issues with this version, such as Chargin' Chucks still existing. I may or may not release another update. I'm leaning more towards "not" and the next version may be the proper World 1 demo. Well, I got a Super Nintendo Classic for Christmas. I hacked it and put my hack's demo on it. Here's a box art image I whipped up for you to put onto your Super Nintendo Classic. If you want to improve the box art image, which it definitely needs, send me a P.M.
As for the hack itself, I can't work on it right now. 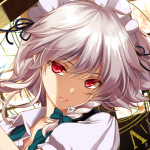 I'm waiting for the VWF NPC sprite to be remoderated and updated to work with PIXI. Yoshifanatic is working on it right now, and, when he last P.M.ed me, I think he was almost done, but he was last on SMWCentral 2 weeks ago. Before, he was logging on about every day. It's highly likely he'll be back for C3, though. 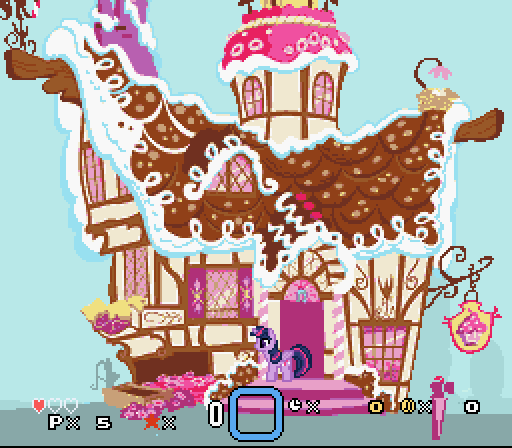 In the meantime, have a screenshot of the interior of Twilight Sparkle's Castle of Friendship. I drew the doors. Yoshifanatic drew Twilight Sparkle's ducking pose and the crystal pillar. The art style looks amazing. 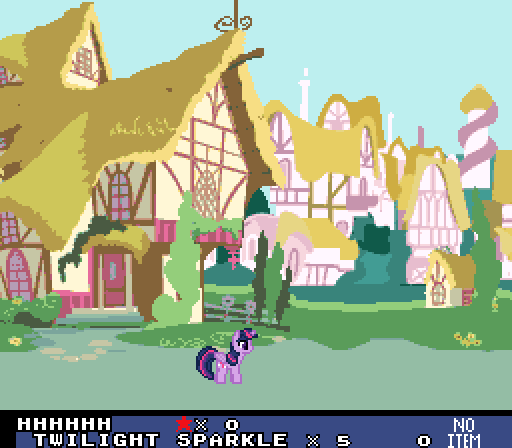 Can't wait to play with 16-bit poners. Marios Adventure in the Dreamworld - My first hack. 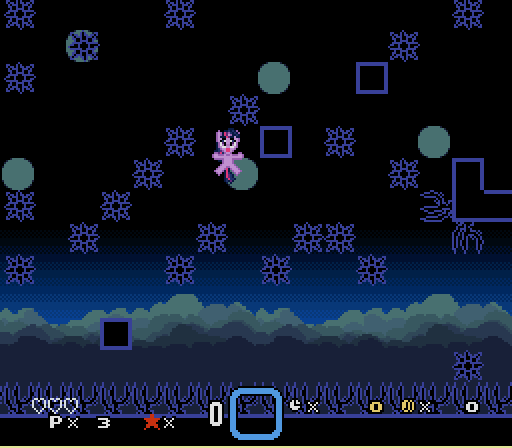 I gotta say, the last SMW My Little Pony related ROM Hack I saw was Pinkie Pie in Super Mario World made by Plastiware. This however, looks like there was more effort put into it! I might do a video on the demo because the screenshots look amazing so far! Keep up the good work! I might do a video on the demo because the screenshots look amazing so far! That would be amazing! Please do so. Thank you for showing support for this game! Also, with help from yoshifanatic, I've revamped the magic charge system. Here is a video of it in action. I'm not a brony or anything, but I kinda like this. Can't wait to see more! Played some of the demo. Not a big fan of stopping on the dime BUT I do enjoy the custom graphics. Gives it a fresh flavor. here's my whole experience. i'm trying to be as helpful as i can. first i saw this forum post and the screenshots and my first experience is WOW. i love some of the graphics. like you've said, you don't want just a mario reskin, i assume you want something really special, so my advice to you is, don't mind to take it overboarder and make something really amazing. you've started out nice. i love stuff like box art and that cute my little pony logo. i even love that you've made a box art! you've really done a lot here and this, i'm not kidding you, can be the real thing and much more then just another super mario world hack. this is kind of like super mario world: bonus my little pony cartridge in a deluxe golden edition pack or something. can be really special. but let not all these nice words slow you down: its a lot of work and it may not be that easy. but in the end, it is so going to be worth it. make something awesome! i will share with you all that i like about your hack and approach and some things that i wouldn't mind seeing different as well as some minor issues i've found. though i'm sure being that this is a demo, you are aware and this all will be improved in a release by far. 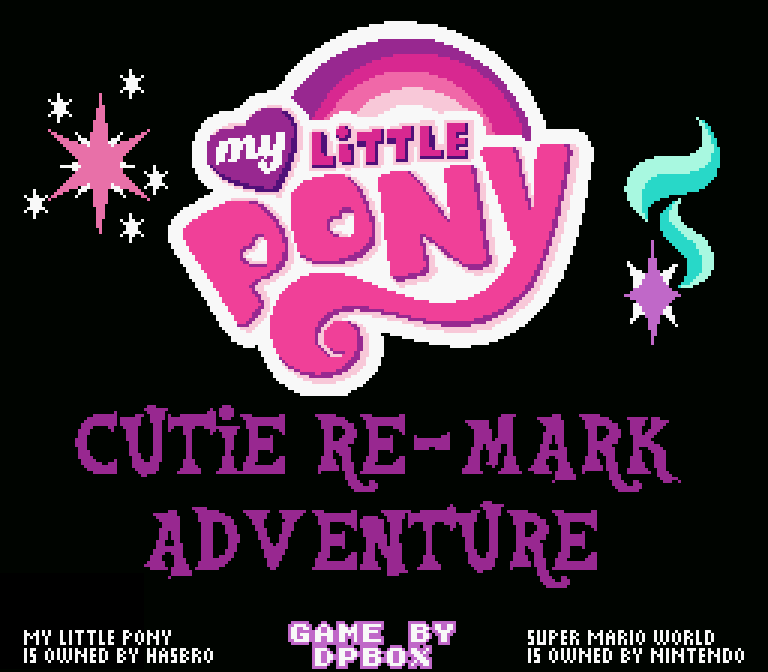 the very first screenshot - my little pony logo, the title of the game: cutie re-mark, which is brilliant. this is the cutesy, colorful and actually, call it plain amazing, style that i'd like to.. sparkle.. throughout the whole game. i advise you to hold on to this style for much of the things in the game. its magical, just like the ending credits ^^ but at the same time i like how EVERFREE FOREST for example, clashes that style. this is good and adds more depth to the game! from the screenshots, first seeing the dialogue boxes for character dialogue appearing in cutscenes and stuff, i'd experiment more with them and likely give them some of the cutesy style and character, perhaps even CUTIE MARKS in the corner. i assume you want to keep them RPG like? you could combine these two styles. first experiences playing, i see a powerfull overworld event before the nightmare castle, awesome liveliness to the game. all together so far it is being really well designed and has many good points. are you trying to make a whole new game using smw as the framework or are you trying to make a MLP spinoff from smw, intending to show that it is an smw based game? probably the first. i realise this is just a demo preview and you are probably aware of all of this but i still mention it. charging chucks from super mario world, sound effects from super mario world, leave it feeling a little unfinished. its both a good thing and a bad thing at the same time. i find it good that it doesn't try to hide its origins, making it appear like a special version of SMW, like i said. an interesting idea you might get something off. on the other hand, this idea looks poorly executed. charging chucks are not necesserely a bad thing, if you like to keep them. but i'd perhaps change them a little to look more, detailed and good. maybe, shadow charging chucks for the nightmare moon castle? 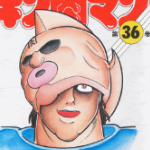 friday the 13th like heavy metal mask with spikes, headless horsemen armor stuff? that night guard vibe.. hmm... just a random idea for inspiration. playing nightmare castle, i notice graphics are too monotonic. i realise, i suppose thats the way its suppose to be, of course, shadow style, but i find it a little poor executed, especially noticed on spike graphics. or maybe these are thorns? i'd also personally redo the smw castle doors. and the middle point.. actually is a nice example of what i thought when i said, keep the SMW spirit making it appear as a MLP SMW bonus cartridge. in that case, i'd keep the SMW middle point appeareance, but change it a little bit to say MLP better, colors come in mind. but not too much. i think in this game, sometimes colors work pretty awesome if they are combined with all sorts of environment, like the example of EVERFREE forest i've mentioned before. that way the whole adventure achieves grater graphical and edventure depth then being a candy glitter haven at the same time giving grater meaning to the colors, making the very best of both. after the middle point, the mazy part of nightmare castle, that graphic arrangement looks better, more clean. the lakitu like cloud enemy shooting fire orbs is great, thats one good enemy. i also liked the blue floating things, i remmember watching MLP episode with them taking over but i'm not sure what they are called.. perhaps make more species of them, ground based for example? along with the flying ones. i remmember they multiplied by division? i think their existence has some potencial in this hack, maybe even friendly but thats straying away from MLP universe i assume and we probably don't want that. entering the boss door in the nightmare castle, i am welcomed with the cutscene. i noticed i could die in this cutscene, twilight sparkle was not trapped and i could fly on the screen and see myself over the background. i could also hear the smw door sound on entering, yet later cutscene after nightmare moon confrontation was keeping me properly trapped in place, even i could still hear the no way, stuck, sound of hitting into something when trying to move out and the door sound was still there. 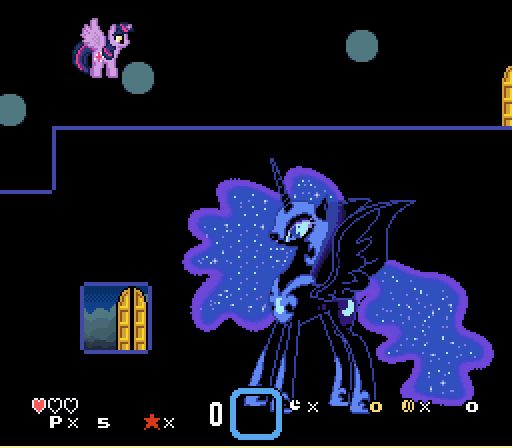 while fighting against nightmare moon, i've noticed that when flying in air and she ground pounds on me, she will stay levitating in mid air at the point where she collided me apparently acting like it is ground. i'm not sure is that intended, it looks ok either way. nightmare moon is beautyfully designed and i liked her blue flame, all pretty beautyfull color. i love how all the pony characters look and its awesome to play being a pony!! i love twilight sparkle being an alicorn and spreading her wings as well as being able to fly, i really love again, that you have said that you didn't want to just reskin mario, but instead went to great length to realise a more true vision. the level clear screen is also great, i love the high res.. lol closer views of characters and the rich character expression. 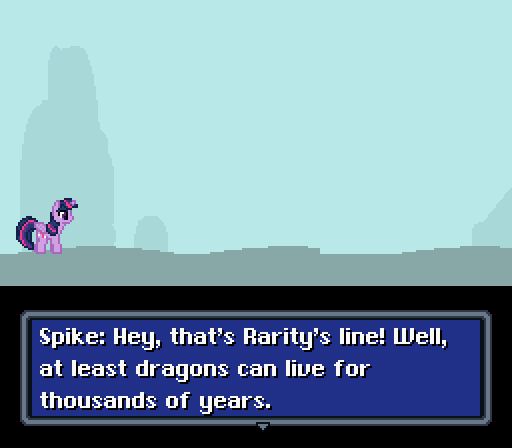 i love how pony characters look as in game sprites, celestia and luna, as well as the choice of music for that moment :heart: thats the cutesy style i expected all the way when i saw some screenshots but at the same time i am glad that it is not, just cutesy. 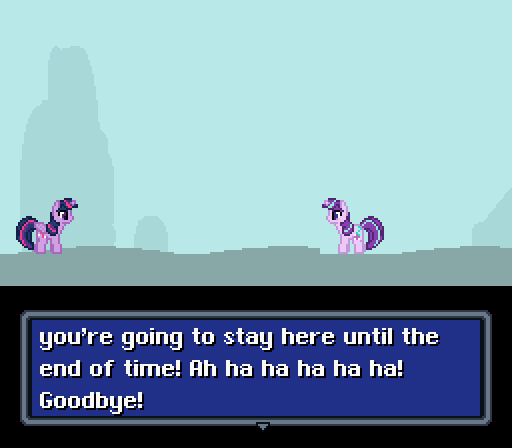 after defeating nightmare moon, surprisingly, this is the end of adventure. well, of course, it is a demo so it makes perfect sense. reading what you wrote here however, i like that you have revealed a grater depth to the game, with friendship token, gameplay and plot explaination. 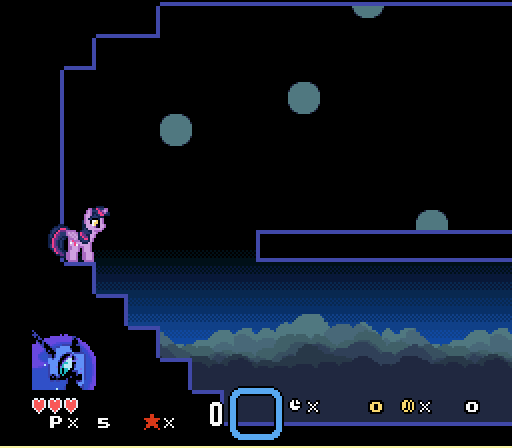 a nice peek..
after nightmare moon is defeated and everything is alright, i like the party stage and the house afterwards just before the credits. these graphics are the strong point that make this game awesome. 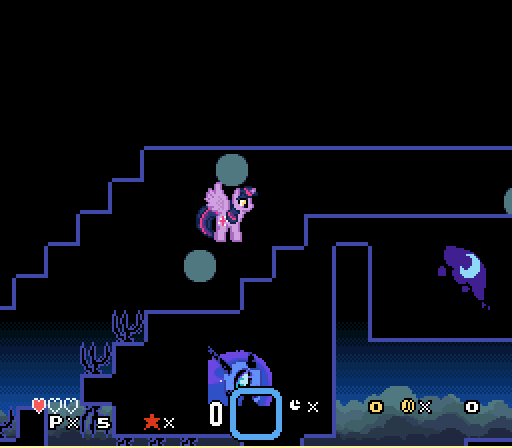 the boss fight with nightmare moon and the cutscene of eternal night is awesome too but i think the casual gameplay maybe, could be a little tiny bit more. the charging chuck part at PONYVILLE PLAINS where you'd have to go right to shoot at sparkles blocks to get in the chuck area was a good touch. not sure what to think of gameplay as this is a demo and i think a release will be pretty different and look more finished. i'd be happy to help you out with more advice and idea in making this game if you want, go ahead and PM me. i like what you've done and where this seams to be going. Thank you very much for the long and positive review! I LOVE that you love the game. I'm still actively working on the game. I'm working on an introduction to the game that will take 10 minutes or longer to get through. By comparison, Super Mario World's introduction only lasts about 5 seconds. Unfortunately, development is very slow nowadays because I'm still at that phase when you're starting a new hack where you're modifying the engine. That type stuff is by far the hardest and slowest part. Once I have the engine and mechanics finalized, once I get the introduction done, and once I start making actual levels, development will be a lot quicker. It would be amazing if I could have the World 1 demo done by Winter 2019's C3, but I don't know if that will happen. College will also start at the end of August, and development will slow to a crawl or even go on hiatus then. Right now, I'm mostly focusing on overhauling stuff like the player graphics. Get a load of this. And in the demo, the reason why the Chargin' Chucks are unchanged is because I wanted to make them Shadowbolt Troopers , but it's very difficult to edit Chargin' Chuck's graphics. Also, fruitillix starwllee, you can definitely help me. I'm in need of helpers, especially ones who are into My Little Pony. I'll send you a PM in a few minutes. I am not a fan of MLP, but the graphics of that player are awesome, congratulations.